Today's run (treadmill): 3.3 miles? I forgot to check! I listened to the weather on my way home from the office last night and was disheartened to hear that we'll be facing below-zero temperatures and more snow this weekend. But then I remembered that we have a new treadmill and suddenly all was right in the world. I was very happy after that, and even happier when my wife reminded be to swing by Panda to pick up our Chinese New Year dinner. With all the snow and ice we've had this year, options for running have been limited. This was made worse with the failure of our treadmill. The only choice I've had this month has been the elliptical machine. While I've come to really appreciate the workout, I've missed running a lot. I work from home on Fridays and that gave me my first opportunity since January 25th to actually run. 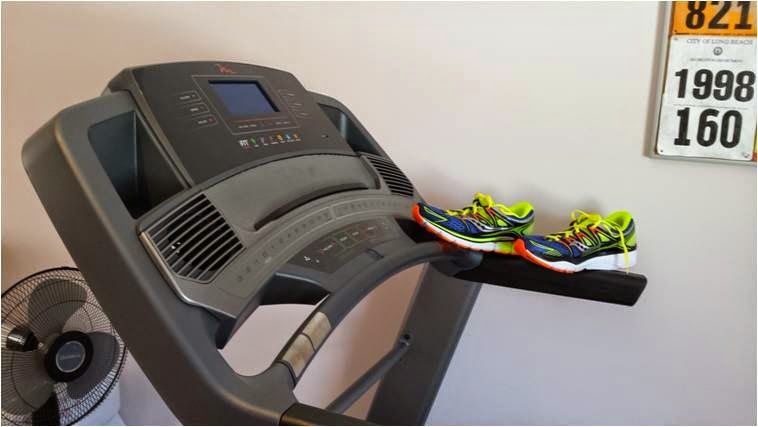 Not only would I be using this treadmill for the first time (the minute I spent on it the day it was delivered doesn't count), but I'd also have my first run in the Saucony Triumph ISOs. I was curious to see how I'd do after three-plus weeks away from running. Did the elliptical sessions preserve my fitness, or would I find myself overtaxed? I plugged my phone into the sound jack and started up a podcast. The very large built-in speaker amplified the voices well enough to clearly hear over the motor. This is so much better than earbuds, which I despise. I stepped up on the new machine and immediately appreciated the quiet, shriek-free experience. The Sauconys felt good underfoot. They are well cushioned but don't feel heavy. The Freemotion's deck suspension feels more responsive than the Sole's. I took it fairly easy to avoid aggravating muscles that are not used to running. Running felt surprisingly good and the first mile went by quickly. I thought the Triumphs felt more comfortable and ran a lot better than the Kayanos. It's really great to be able to run again after almost a month and I was pleased that I got through today's workout without feeling like I've lost fitness. I may find it a bit tougher when I finally return to the road. Overall, I should do fine. I know I'll eventually disparage the idea of treadmill running, but for now, it's great to have that option again. Yay for returning to running!! Has it really been that long? Yep - January 25th was the last time I ran before yesterday. Despite all the elliptical workouts, I was a little sore last night. "The Freemotion's deck suspension feels more responsive than the Sole's" - are you talking about your sneakers or the Golden Gate Bridge? Oh, and I'm glad you're back in the game. The FM 850 is actually engineered as a miniature version of the Golden Gate bridge. It's great, except for the $7 toll I have to pay every time I run on it. It's good to be back to running again. We REALLY need to run Bethpage once the path clears. There's nothing like new running stuff to motivate you. This winter especially. I'm appreciating my treadmill more this season with all the snow. I hope you don't end up liking your new treadmill more than running outside! Fear not, "preferring the treadmill" is only relevant when comparing it to the elliptical (or push ups).